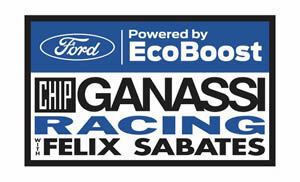 INDIANAPOLIS (December 16, 2014) Seven-time IMSA Champions and five-time Rolex 24 At Daytona Winners Chip Ganassi Racing with Felix Sabates (CGRFS) announced today partner Ford and their EcoBoost engine technology will serve as the primary sponsor of the No. 01 in the Prototype category for the TUDOR United SportsCar Championship (TUSC) season-long effort with drivers Scott Pruett and talented veteran road racer Joey Hand. Both Ford and Hand step into their new roles with the team as part of multi-year deals. Ford’s Rich Sports Car History: Ford's history with sports car racing stretches back to the 1960's, with its legendary factory effort at the 24 Heures du Mans. Today's factory effort plays an important role in developing Ford Motor Company's EcoBoost technology. Ford's twin-turbo 3.5-liter EcoBoost V6 raced to three wins with CGRFS, including a win in the prestigious 12 Hours of Sebring, seven podiums and more than 15,000 endurance racing miles in its first season of TUDOR United SportsCar Championship competition in 2014. In fact, the Sebring win was Ford’s first overall win as a manufacturer since 1967. Hand Finds a Home at CGRFS: Joey Hand, widely considered one of the best road racers in the world, returns in a full-time capacity after helping CGRFS win the 2011 Rolex 24 At Daytona with Pruett in his first of three appearances with the team (2011-2013 Rolex 24 At Daytonas). Hand led the most laps in the 2011 Rolex 24 At Daytona, leading 116 of the No. 01 car’s race-leading 231 laps. He led the race six times overall en route to the team’s fourth win in the sports car classic. Hand had previously been competing in the DTM series from 2012-2014 and had been in the American Le Mans Series from 2004-2011 where he won two 12 Hours of Sebring and the 2011 GT Driver Championship. Pruett and Hand enter the 2015 TUSC season with a combined 71 IMSA wins. Pruett in the Record Books: Pruett is tied for the all-time record with five Rolex 24 At Daytona wins (1994, 2007, 2008, 2011, 2013) and joins Hurley Haywood as the lone five-time Rolex 24 At Daytona Winners. He is the first American to score 12 major sports car championships - his closest competitor is the late Peter Gregg who has seven to his credit, and his previous titles include two IMSA GTO Titles (1986, 1988), one IMSA GT Endurance (1986) and three Trans-Am Championships (1987, 1994, 2003). Pruett continues to extend his record as the all-time leader in IMSA wins with 58 victories.